How do I calculate if it is more sustainable to have my groceries delivered? I have been wondering recently whether having my groceries delivered is a net ecological benefit or not. It is highly likely that the overall environmental impact of the diesel used to delivery my groceries, when amortised over all of the deliveries, would be less than the impact of my own individual petrol journey to and from the supermarket. However, how do I take into account the fact that when the supermarket delivers it uses plastic bags, whereas if I were going there myself I would be using reusable bags. It is not obvious to me what the relative environmental impact of these two factors are, or how I can make a sustainable decision. The only option that I can see which would be win-win would be to take public transport to the supermarket and use my reusable bags. That way both my travel and materials footprints would be reduced. Alas there is no convenient public transport available, which leaves me in my present dilemma. So, how can I easily calculate if it is more sustainable to have my groceries delivered using plastic bags, or drive to buy them myself and use reusable bags? This assumes you use the same cloth bags that whole time (totally doable), that each trip requires 4 cloth or 6 plastic bags, and that the bags end up occasionally reused (as per the original data). The results are mixed, and I'd need information on how much petrol would be saved by delivery to give a final answer. This does, however, provide some guidance - I'd say saving more than 1 L per trip becomes increasingly unlikely, and reusing a bag 200 times is reasonable. Edit: One more note - you could do the same calculation for any number of other impacts, as the sources above have the numbers for many of them. I just tend to settle on GWP because carbon is often what people refer to when they say 'more sustainable'. Edit2: The original spreadsheet can be found as a Numbers file here or as an exported XLS file here. The only option that I can see which would be win-win would be to take public transport to the supermarket and use my reusable bags. For five years, I actually had a trailer specifically for hauling my two kids around in (the Cheetah Chariot 2 kid version, now owned by Thule), but it would do double-duty as a stroller and a shopping cart while I was in the store. 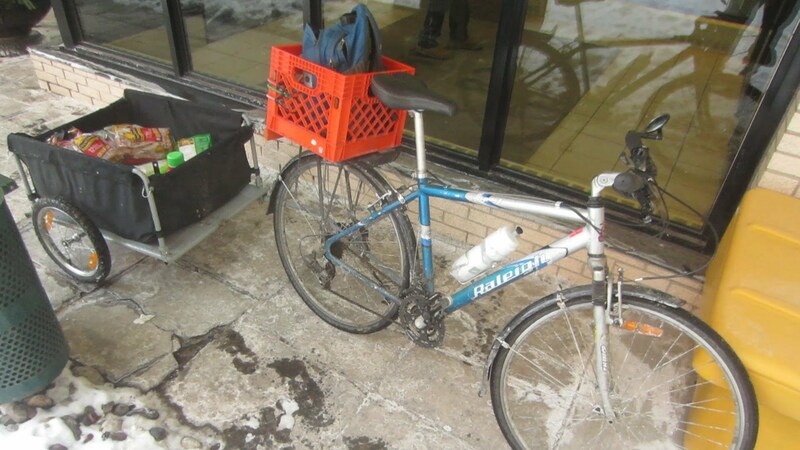 Then, I'd hook it up to the bike, full of groceries (and kid! ), and I could drive it right to my door, making it even more convenient than driving a car. The Cheetah was also great in that it did a very good job of keeping its contents out of the weather. If the kids weren't in it, I could fit as much stuff as you can put in the trunk of practically any car. Your circumstances may vary, but for those five years, I did not own a car at all. I didn't own a car for the five years previous to that either, but the trailer I only got after we started having kids. The second best option, which is more expensive and not quite as good for the environment, is to just buy an electric car. That's the way we do it now, but it's mostly a function of where we live, to help care for my father-in-law. Not the answer you're looking for? Browse other questions tagged plastic bags vehicle grocery or ask your own question. Which is more sustainable: Paper Bags or LDPE Bags? Older biodiesel vehicle or newer but used hybrid, which is actually more sustainable? When bringing your own reusable bags for produce that needs weighing, what's the lightest option?